I have been a little obsessed with making "gourmet" burgers, ever since a visit to Kuma's Corner in Chicago a couple months ago. I have always loved a good burger, but I must admit to being a bit lazy at home when I make them. I will make a Juicy Lucy (stuffed burgers, for non-Minnesotans), who doesn't love those ? But taking out and prepping a bunch of toppings always seemed like too much work. Then we went to Kuma's...and they have all these really interesting combinations of flavors, with rock star names. I was in love ! And after I thought about it, it really isn't that hard, and in most cases, I could re-purpose items from my refrigerator as "gourmet". Crafty, no ? This recipe used two items from my refrigerator that we use over and over again: pickled onions and roasted garlic mayo. Both are simple to make, and can be used for burgers, salads, tacos, you name it ! These recipes make more than you will need for this dish, so save them on hand for other things...I know you will use them ! Add a garlic cheese stuffed burger, and it could have been on the Kuma's menu. Mix together the burger, Worcestershire sauce and grill seasoning in a large bowl. Separate into 8 equal portions, and make burger patties. Lay one portion of cheese on top of one burger, and top with a second burger patty. Carefully pat together and seal the edges. Repeat until you have four stuffed burgers and set aside. Cut the tops off the heads of garlic, and drizzle liberally with olive oil. Sprinkle with salt and pepper, and wrap in foil. Place on hot grill, and roast, turning frequently, for 30 minutes. Let cool. Place mayonnaise food processor, then squeeze the garlic cloves out of the heads into the mayonnaise. Process until smooth and refrigerate until you are ready to use. Place onions in a quart jar. Cover with remaining ingredients, and give a jar a good shake. Let sit on the counter for one hour, or refrigerate. Refrigerate leftovers after opening. Preheat grill to high. Place burgers on grill, and grill for 4-5 minutes each side until they reach your desired level of doneness. Remove from grill and let rest. I like to grill the hamburger buns for a minute before serving as well. 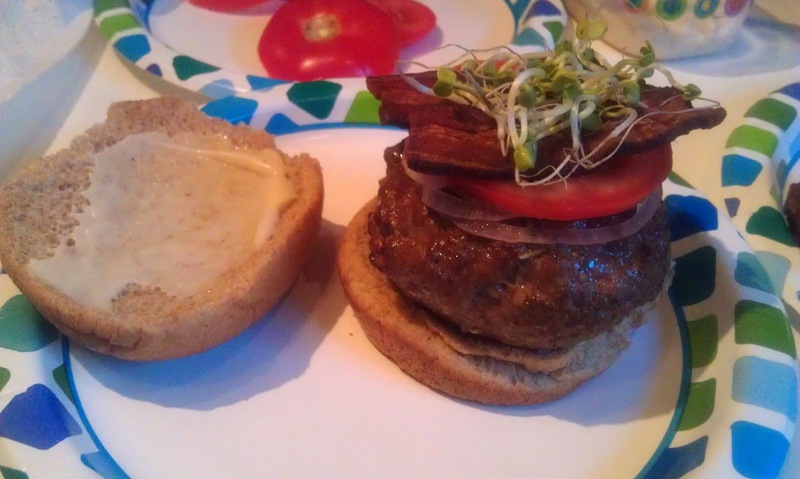 Spread mayo on both sides of the bun, place burger on the bottom, then top with tomato, bacon, onions, and sprouts. Top with your toasty burger bun top, and take a big bite !